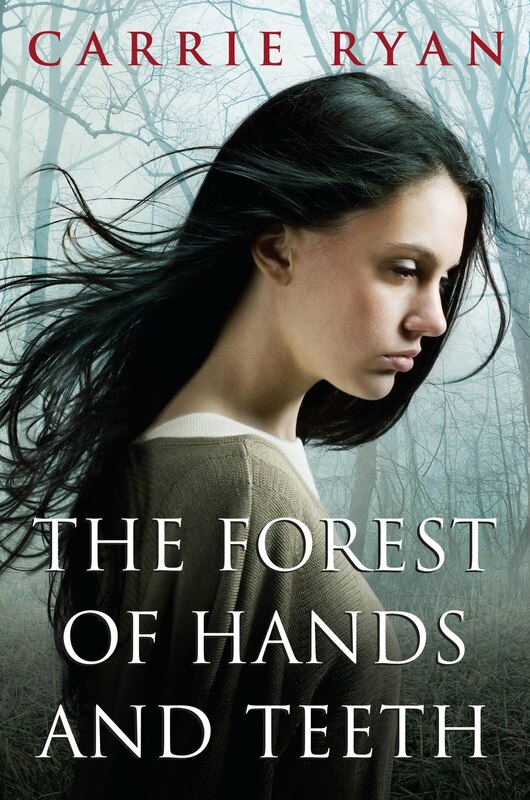 Mary lives in a remote, fenced-in village in the middle of a forest they call the Forest of Hands and Teeth. The fences keep out the Unconsecrated: flesh-eating humans infected with a highly contagious virus (the word "zombie" is never mentioned in the book, but that is clearly what they are). The Sisterhood are the only form of government the village has; they are responsible for the education of the children and the safety of the residents. Mary's mother often tells her stories about the time Before, about the ocean and the tall buildings that reached far up into the sky. She has never been the same since her husband disappeared. She refuses to believe he is among the Unconsecrated, yet she is continually drawn to the fence, dreading to see him there, moaning with hunger, trying to get through to the village. One day Mary lingers a little too long, talking with a friend, and when the sirens sound she knows something horrible has happened to her mother. From that moment on, Mary finds herself moving a world that she once thought she understood but now is full of secrets and lies, of unpleasant and unpalatable truths. People she thought she knew behave in hurtful, unexpected ways, and Mary finds that the only one she can rely on is herself. This is a novel that should appeal to those who enjoy dark, harrowing post-apocalyptic novels, as well as survival stories. It is a fairly introspective tale, despite the action and adventure aspect, told through first-person narration from Mary's point of view. Mary is a compelling character, and I felt immediate sympathy for her, but she was the only character I felt a strong connection with. I felt occasionally frustrated by her inability - or unwillingness - to communicate with certain characters, and at times it felt as though the lack of information passing from her to other characters was more a convenience to the plot direction than a believable action (or inaction) on her part. The story is bleak and would probably be difficult for more sensitive readers, and I'd recommend this to high school ages and up (although there are always a few younger readers who thrive on this sort of dark tale). I found the story to be riveting - it was had to put the book down, and there was a definite creep factor that eased its way under my skin. I did, however, find the ending disappointingly inconclusive. Admittedly that is a personal bias of mine (I've always hated those open ended, you-decide-for-yourself kind of stories, feeling that it's a total cop-out on the part of the writer. If you're to going to write it, I've always thought, then tell the whole story!). Don't get me wrong - the book has a conclusion; it doesn't end with a cliff-hanger. But it leaves scads of unanswered questions that left me feeling very dissatisfied and a teensy bit annoyed, particularly as I'd been so attached to the story throughout. But I have learned that there are going to be two more books in this series, so I'm feeling much better about things now. For more information on the series, check out Carrie Ryan's website. The Book Zombie: "Being the huge zombie fan that I am, I was a little skeptical of how a young adult novel would pull off a serious zombie story. But I was more than satisfied, the undead action is excellent." Bookshelves of Doom: "The lack of answers totally makes sense considering the knowledge/background of the narrator and the storyline, but that logic isn't going to stop some readers from wanting to throw things when they reach the end of the book." Stuff as Dreams Are Made On: "If you’re a fan of YA books, zombie novels, philosophical novels or all of the above, this is definitely one to pick up." The Written World: "To sum it all up, I should say that this is probably one of my favourite reads from 2009 and it will likely make my best of lists at the end of the year!" sounds like a perfect read for December when everything is so bright and cheery. Mariel - I will be very interested to hear your thoughts on this one! I loved this book and I think it's going to be one of my top reads of the year. Because I knew this was the first in a trilogy, the ending didn't bother me. Beth - I'm glad you enjoyed it, too! I wish I had known about the other books - I think my expectations would have been different. But still, I'm happy I know about them now! Cannot wait for the sequel. I loved this. I just love books that are riveting and hard to put down. Sounds like a good book for the gloomy weather I'm having here. I read your review and just had to read the book. And I looked everywhere! It would not be found. Talk about frustrating! Then my birthday came, and the longing for this book had crept deep in to the back of my mind, and my brother gives me a gift - for the first time in ages. And guess what? It was The Forest of Hands and Teeth! It was like I could eat him, that's how much I loved him. Great book! Loved it, but hated it - if you can say that. Laughed, cried a little, my heart raced at some points, and, boy, I hated the ending. Denise - I know, I'm sorry! But I have to say I felt much better about that ending when I heard she had a sequel in the works. That sure will recruit a lot of people ;) I'm in!